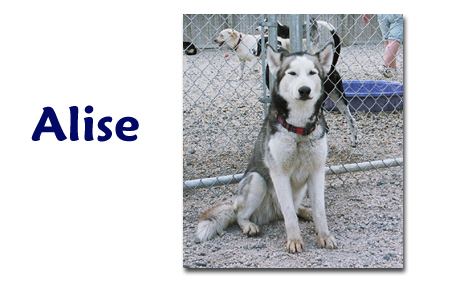 Alise found her new home on June 24, 2006 with Melissa, John, Bandit and Ti. Alise is a very special dog. She is a lucky enough to have many guardian angels looking out for her well being. Found running in the streets, neglected by a family that didn’t want her anymore, Alise was taken in by Donna a Good Samaritan. Donna needed some help to find Alise a home so her friend Beth stepped up assist her. These wonderful ladies contacted TOTTSHR and on Alise’s first adoption she found love at first sight. Alise and her beloved friend Bandit immediately hit it off and Melissa and John decided that Bandit just couldn’t live without his best new best friend. Melissa, John, Bandit, Ti and their feline friend all welcomed Alise home on June 24th 2006. Congratulations to all! Alise has found a great home! We could not have asked for a better fit into our home. I want to thank you again for all of your help in finding Alise, she is so precious and we love her very much. Alise and Ti get along just fine. 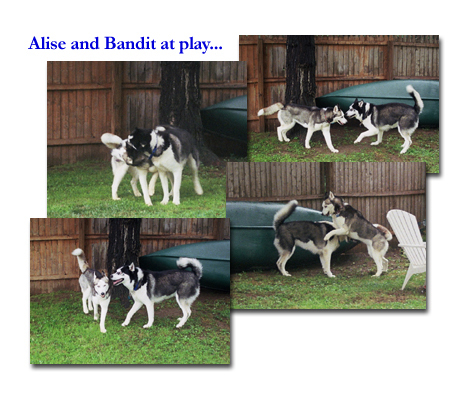 Bandit and Alise are inseparable, they can’t do anything apart.